Rosalyn L. and James B. Pick join NIU President Doug Baker at the dedication ceremony for the James B. and Rosalyn L. Pick Museum of Anthropology. After 50 years at NIU, the Anthropology Museum has a new name. 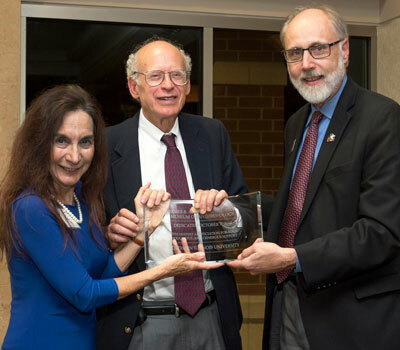 The newly dedicated James B. and Rosalyn L. Pick Museum of Anthropology honors the generous support of an NIU alumnus and his wife, marking a new era for the museum. “NIU offered me a new and exciting opportunity that led me to my master’s degree in biology, an important stepping stone in my career,” said James Pick during a private museum dedication Oct. 9. 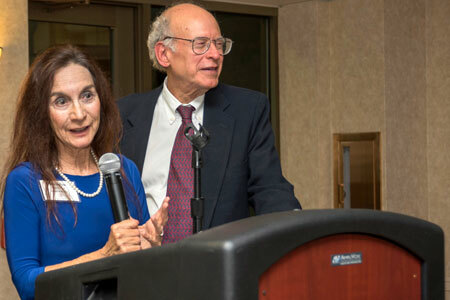 He and his wife, Rosalyn, were delighted to be able to make the gift that has created an unrestricted endowment to enhance and expand the NIU museum’s collections and programs. James Pick holds an M.S.Ed. from NIU, as well as a B.A. from Northwestern University and Ph.D. from the University of California Irvine. For many years a full professor in the School of Business at University of Redlands in California, he has worked actively in research and teaching in information systems, urban studies and geographic information systems (GIS). Pick also is past chair of the Department of Management and Business, past faculty assembly chair of the School of Business and founding director of the Center for Business GIS and Spatial Analysis. He is author or co-author of 12 books and more than 145 scientific publications, and has received many awards including a Fulbright to Mexico. He joined the NIU Foundation Board of Directors in 2014. Rosalyn Pick, a licensed psychologist in California, began her private practice in 1981. Specializing in treating adult problems, she holds an A.B. from Brown University, an M.A. in general-experimental psychology from the University of Hartford and a Ph.D. in psychology from the University of Iowa. She has served her field in a variety of local and regional leadership capacities. Originally founded in 1964, the Pick Museum of Anthropology has a rich history as a teaching and research collection where faculty and students can explore what it means to be human through the material record of human history. By holding an object, such as the actual obsidian blade used by a Maya king in ritual self-sacrifice a thousand years ago, students can experience other cultures and be transported to other times in a much deeper way than is possible in the classroom or textbooks. The Pick Museum of Anthropology builds upon this legacy to strengthen the educational environment at NIU, demonstrate the regional and global impact of the university’s scholarship and serve as a cultural destination where the study of what it means to be human is shared through powerful programs and exhibitions that resonate with audiences. The gift is already transforming the museum into the cultural heart of the community and university, providing dynamic opportunities for people of all ages to marvel at the world’s cultural diversity, revel in the history of human innovation and become more active citizens in a global community. By providing matching funds for federal grants, the gift allowed the museum to apply for and receive two significant grants from the National Endowment for the Humanities and the Institute for Museum and Library Services. These grants allow the museum to hire students in career-building work and upgrade the museum’s collection stewardship so it serves as an example of best practices. Additional funds provide for the expansion and acquisition of new collection objects, to strengthen NIU’s global scholarship and international partnerships. “It is our core philosophy that museums change lives,” said Jennifer Kirker Priest, director of the Pick Museum of Anthropology.